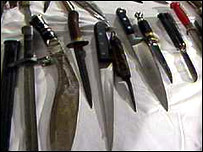 40,000 knives were handed in during the last amnesty in 1995. A national knife amnesty has been announced by Home Secretary Charles Clarke in a bid to halt the rise in crimes involving the weapons. Mr Clarke said the project, to allow people to hand in weapons without fear of prosecution, would run for five weeks this summer, starting on 24 May. Police forces throughout England, Scotland and Wales will be involved. 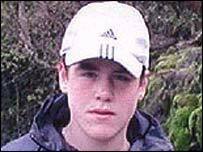 Mr Clark said tackling knife culture, particularly among young people, was "paramount" to community safety. He said: "The message of this campaign is simple - carrying knives on the streets will not be tolerated. "Every weapon handed in during the amnesty will be a weapon that cannot be used in crime." He added: "Anyone with a knife, or other offensive weapon that might be used to cause fear and distress on our streets should take this chance to get rid of it." Tony Melville, of the Association of Chief Police Officers of England and Wales, said it was an opportunity to reduce the opportunity for people to commit violent crime. He said: "The harm caused by knives and similar type weapons not only impacts on victims, but their families, friends, neighbours and the local community. "Taking knives off our streets will save lives and cut crime. Every weapon that is handed in is one that cannot be used in causing the horrific injuries or even worse that is often associated with knives." Paul Walmsley, whose son Luke was stabbed to death at a school in Lincolnshire two years ago, told BBC News the amnesty had to be followed by tough action if it was going to be effective. He said: "Normal law-abiding citizens will give the knives up if they've had some stored in the garage or in a shelf or a cupboard or somewhere. But I don't think it will stop the criminals from carrying knives." He added: "Anything what can come on the back of the amnesty is going to be a step forward. I just hope the government put measures in place to make this happen." Carrying an offensive weapon in a public place "without lawful authority or reasonable excuse" carries a sentence of up to six months' imprisonment. During a similar amnesty in 1995, 40,000 potentially lethal weapons were handed in. The announcement of the latest drive comes nearly a month after the high-profile killing of City lawyer Thomas ap Rhys Pryce, who was stabbed to death in North London on his way home from a night out. Home Office figures released in 26 January showed violent crime in England and Wales rose 4% between July and September last year. The Home Office says the amnesty is part of a wide range of actions being taken to tackle knife crime, including toughening the law on carrying blades. Other proposals include raising the age at which people can legally purchase knives from 16 to 18 and giving teachers power to search pupils for knives at school.